The draft conference program is now available for download in PDF. If you are looking for accommodation options, you can use the following list of hotels located in the walking distance from the conference venue. We welcome you to take part in DELL EMC UNIVERSITY OPEN Day that will be held on April 4, 2017 in Dell EMC research center (Address: Sredny prospect 36, 5th floor). Participation in the UNIVERSITY OPEN Day is free of charge for all FRUCT conference participants, but you shall make separate registration on the UNIVERSITY OPEN Day page. The event agenda and registration link can also be found at the UNIVERSITY OPEN Day page. Due to large number of submissions we have to a bit postpone release of the first draft of the 20th FRUCT & ISPIT conferences program. It is expected that the draft program will be published on March 20, 2017. If due to travel and visa arrangements you need to have earlier decision on the date and time of your presentation please write to email info<at>fruct.org and we will try to fulfill your request. The 20th Conference of Open Innovations Association FRUCT will be held in the center of Saint-Petersburg (Russia) at the Saint-Petersburg State Electrotechnical University (ETU "LETI") (Petrogradskaya, ul. Professora Popova 3), and the Seminar on Information Security and Protection of Information Technology will be held at Technopark of ITMO University (Vasilievskiy island, Birzhevaya liniya 14). Accepted and presented conference papers will be published in the FRUCT proceedings (ISSN 2305-7254). In addition, all accepted Full Papers will be published in IEEE Xplore, indexed by Scopus and DBLP and included to Scimago Journal Rank. Selected papers will be recommended for CPCI indexing (Web of Science) and to IJERTCS journal. Program of the 20th FRUCT, e-Healthcare & ISPIT conference will be published on March 13, 2017. If due to travel and visa arrangements you need to have earlier decision please write to email info<at>fruct.org and be prepared to make proportionally earlier submission of your paper. The 20th FRUCT conference is sponsored by IEEE North-West Russia section. Submission of papers to the 20th FRUCT conference is now open. Information on conference fees and other details can be found at CFP and Registration pages. The conference page and Call for Participation of the 20th FRUCT conference are available. 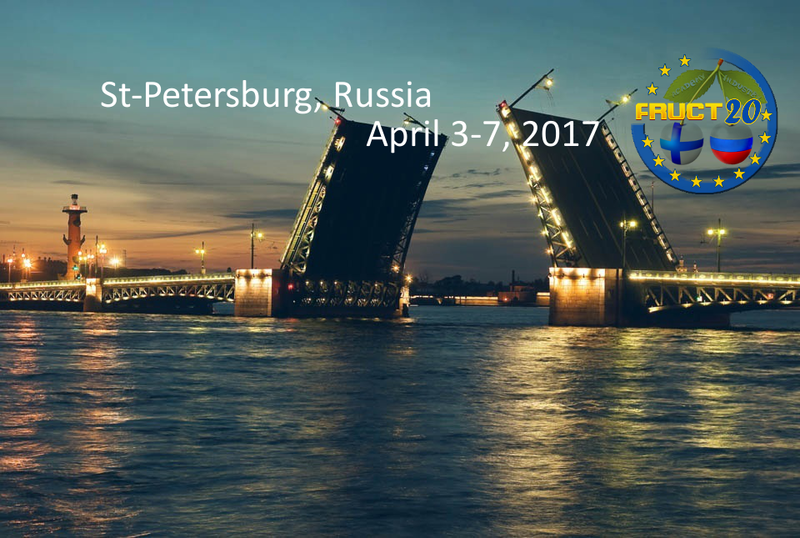 The conference will be held in Saint-Petersburg, Russia, on April 3-7, 2017. As usually the first 2 days are reserved for trainings and internal meetings of the FRUCT Association members, and the main conference days are April 5-7, 2016.